After Christmas there is always so much to do, and sometimes it can be overwhelming. 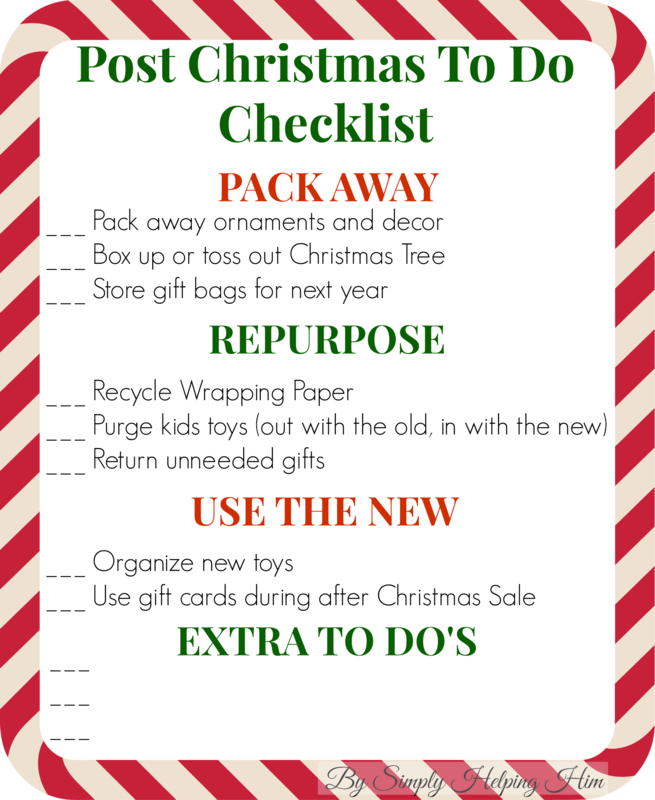 I know I do well having a checklist to keep me on track, so I decided that I would create one for after Christmas clean up! Today I’m sharing it with you, so it will hopefully help you be more organized after the Christmas festivities. As you are tidying your home after the holidays I ask that you pray about where God would have you send all of the “old” things that your kiddos no longer need. There are many places that you can donate gently used toys, clothes and books. Church nurseries are always in need of them, foster care kids, doctor’s offices, children’s hospitals, libraries, etc. Touch base with the directors of places such as these in your area, and see if they accept such donations. Please be sure to not include items that are overused, these donations are to bless others not burden with items that are unusable. Remember it is a blessing to be a blessing! I hope this checklist is a blessing to you as you tidy your home in the coming weeks! So very true! So often we have more than we need & getting the old into the right hands is such a blessing for someone. May we use wisdom in these days of sorting & cleaning up. Amen! Being a blessing after we’ve been blessed is such a wonderful opportunity! Thank you for stoppin by! Blessings!